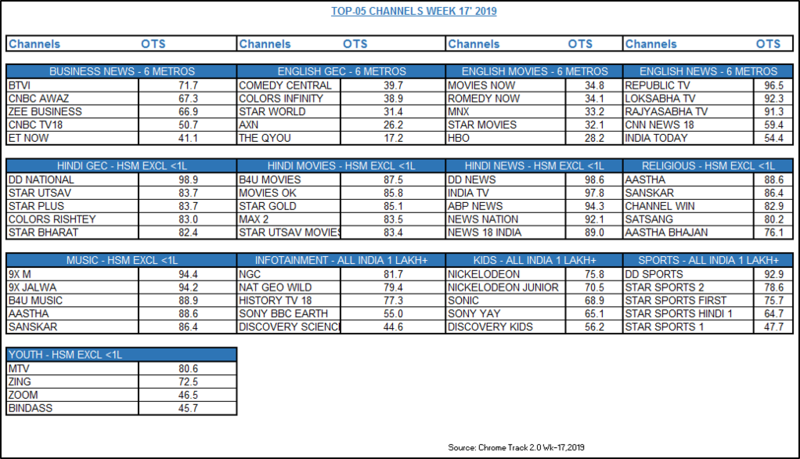 MUMBAI: With a growth of 8.13 per cent, the Hindi news genre marked the highest opportunity to see (OTS) among all categories in week 52 of Chrome Data Analytics & Media. In the Hindi news genre, India TV gained the highest OTS with 99.5 per cent in HSM excluding less than 1L-market. The second position in the gainer’s list of OTS was grabbed by the religious genre with the growth of 7.71 per cent in HSM excluding less than 1L-market. Aastha was the most benefited channel in this category with 97.9 per cent. The third position in the gainers was garnered by the music genre in HSM excluding less than 1L-market with 6.76 per cent OTS. 9X Jalwa gained the highest OTS with 94.1 per cent. The Hindi movies genre was at the fourth position in the list with 6.71 per cent growth and Rishtey Cineplex catered to 95.2 per cent OTS in HSM excluding less than 1L-market. The youth genre was at the fifth position in the list with 4.33 per cent growth in HSM excluding less than 1L-market. Bindass gained the highest OTS with 92.7 per cent.